Section 21(a) Possession Notice for ending a tenancy created before 1 October 2015 and where the fixed term has expired. This is a mandatory document for any landlord wishing to regain possession or agree a new tenancy and must be completed correctly to be valid. The notes that accompany the notice guide you in how to do this. Note: this form is only suitable for use where the tenancy agreement is effective before 1 October 2015. For tenancies created after this date, use Form 6A instead. We continue to make this document available for landlords with older AST agreements. For tenancies created before October 2015, this is the form that landlords must use to serve notice to quit once the fixed term has ended. A Section 21(a) Possession Notice must be in a prescribed format and must be completed correctly to be valid. Use this document either to regain possession of a property, or to end a tenancy agreement for the purposes of arranging a new one with the same tenants. This Section 21(a) Notice complies with the Housing Act 1988 and the Housing Act 1996. There are two Section 21 notices, each to be used in a different circumstance. A Section 21(a) notice is only valid if the fixed term of the tenancy has expired and the tenants are renting on a periodic basis. 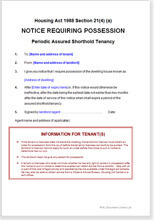 This document is suitable for a landlord who has let his or her property under an Assured Shorthold Tenancy agreement (AST), where the fixed term of the tenancy has expired and a periodic tenancy is in place. The alternative Section 21(b) Notice should be used if the notice will be served to the tenants before the fixed term of the tenancy ends. You may like to read our article on How, when and why to serve a Section 21 notice, which explains in more detail the difference between a fixed and a periodic tenancy. For example, the fixed term of a 6 month tenancy starting on 1 August would expire on 1 February. If the landlord wanted to serve notice before 1 February, he or she should use a Section 21(b) Notice. If it is now after 1 February (the tenants have continued to live in the property on a periodic basis), then this Section 21(a) Notice should be used. Whichever Section 21 Notice is used, the landlord must give the tenants at least 2 months notice, so in our example, to have the tenants move out on 1 February, a Section 21(b) Notice must be served before 1 November, and a Section 21(a) Notice served on 2 February would end the tenancy on 2 April. A Section 21(b) notice served on 1 January would mean that the earliest the tenants would move out would be 1 March. A Section 21 notice is the only valid way of ending an assured shorthold tenancy where the tenants have not breached the tenancy agreement. It must also be completed in a prescribed format (we explain how to do this in our guidance notes) in order to be valid. Your tenant may be able to refuse to leave the property if you don’t serve the notice correctly. "Reasonable price. Contained just the layout and info I needed. Saved time in production and of course legal fees." "Makes me wonder why I have spent so much for so long with lawyers who charge £200+ per hour and take ages to make something complex!"